In our current season we have two examples of art inspiring art from two diverse fields: Surrealist art, specifically the work of René Magritte, on our production of The Magic Flute by Dominic Cooke; and the world of fashion as represented by Vivienne Westwood, reflected in the costumes of Madeleine Boyd for Roberto Devereux. To some, the obvious link between art and opera might be the posters that advertise a production, but it can be much more direct than that and a piece of art, an artist, or a movement, might actually inspire a production itself – as with our colourful, fantasy filled, The Magic Flute. Surrealism as a cultural movement seemed uniquely created to happily incorporate stage design into its remit. One perfect example, although not for opera, is Erik Satie’s early 20th century (1917) ballet Parade – a piece that had Picasso as the original designer and was co-created by Jean Cocteau, who wrote the scenario. Other art movements also welcomed stage design into their sphere, for example: Art Deco (another movement from the early 20th century) was a highly decorative style and many cinemas were built under its influence during this era, but set and costume designs were also popular. Erté, one of the major proponents of the scene, was designer on operas including Rigoletto,Pelleas et Melisande and Der Rosenkavalier for various American opera companies. Going back to The Magic Flute, it appears that the fantastical realms in Mozart’s last opera provide the ultimate opportunity for Art to inspire/influence the set and costume design. British artist David Hockney has designed sets for over 40 years, including a version of Flute for Glyndebourne in 1977. Marc Chagall (another artist associated with Surrealism); ‘Where the Wild Things Are’ author/illustrator Maurice Sendak and the English satirical cartoonist Gerald Scarfe have all designed productions of The Magic Flute too. 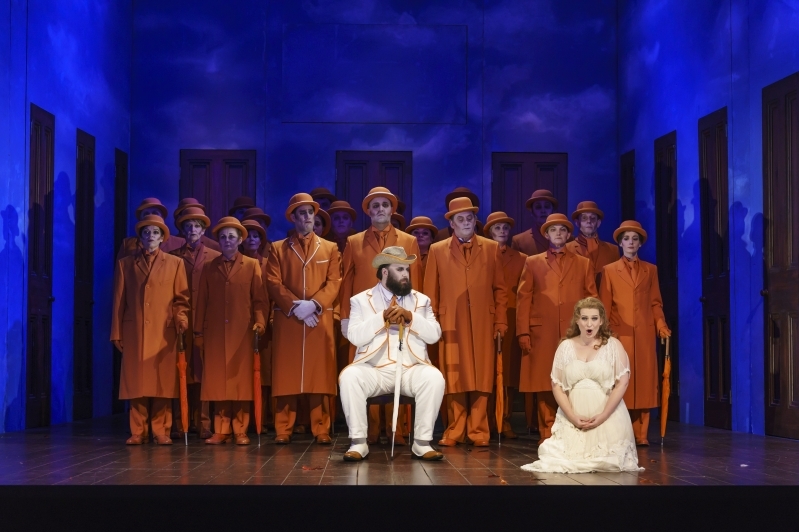 Such a wealth of art crossovers in production designs for The Magic Flute even led to an exhibition at New York’s Public Library for the Performing Arts in 2016, exploring the different interpretations. But it isn’t just fine artists crossing over into stage design – in 2013 the Los Angeles Philharmonic at Walt Disney Concert Hall came up with a creative team that included architect Frank Gehry (who designed the hall) along with fashion designers Kate and Laura Mulleavy (aka Rodarte, who also designed the costumes for the Oscar-winning film, Black Swan), working on Don Giovanni, in a series of three Mozart operas, although not Flute: The Marriage of Figaro, Don Giovanni and Così fan tutte. British-Indian artist Anish Kapoor has previously stated (in the Guardian – quoted on dezeen.com): ‘That is what making a set for opera is all about – encouraging one to suspend disbelief, or rather encouraging belief in the unbelievable.’ And isn’t The Magic Flute the perfect exemplar of this. 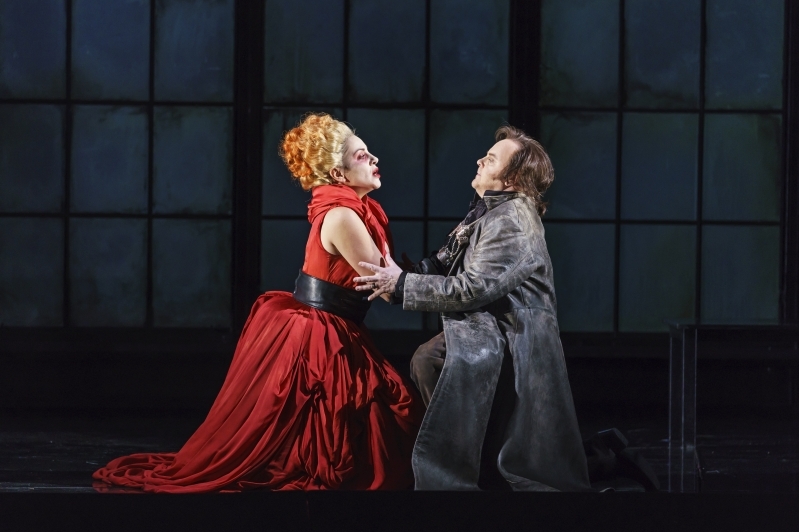 Then last year the V&A held the exhibition: ‘Opera: Passion, Power & Politics’ – taking it all full circle? The V&A has also recently put on exhibitions celebrating fashion designers and the fabulous scarlet gown of our Elisabetta, Queen of England, in this Season’s Roberto Devereux, could have come straight off a classic Vivienne Westwood catwalk. Costume designer, Madeleine Boyd seems to have worked with the same inspirations as Dame Vivienne, linking the past and present in designs that are clearly made to stand out. With hints of the punk aesthetic of Vivienne’s early work in the thick leather belts and metal corsets. Elisabetta’s dress, a vibrant red in among the different black textures of both the other costumes and the set, fits with the character of the real Elizabeth I who manipulated her appearance, using it as a statement, a symbol of her stature. Is it any surprise that the art fields crossover into each other as all are just different means of expression? See WNO’s two examples of art inspiring art in this Spring Season as our tour continues to Bristol, Llandudno and Southampton, and see what you think.